Face Paintings: Takashi Murakami is internationally renowed contemporary artist of Japan know for his "superflat" aesthetics which describes both Japanese artistic tradition and the nature of post war culture and society. Takashi works in fine arts media such as Painting and Sculpture and commercial media such as fashion,merchandise and animation is known for blurring the line between high and low arts. His works has been noted for use of colour, incorporation of motifs from Japanese traditional and popular culture, flat/glossy surfaces, and content that could be described at once as cute, psychedelic or satirical. Face Painting is all concerned with fun and ofcourse no costume needed. Inspired by the art Works of Takashi Murakami Make up for ever, a professional make-up school in paris engaged themselves to recreate the works of Murakami using face Paint. 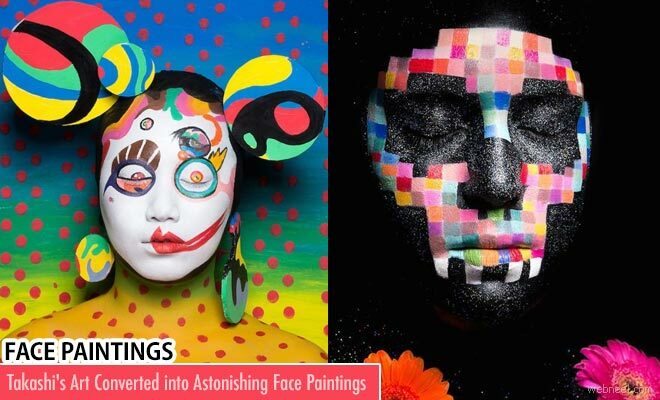 These face paintings definitely honour the art work of Takashi and brings glory to his work. The professional artists who created the face paintings with takashi's works has proved excellent and has taken the industry by storm.